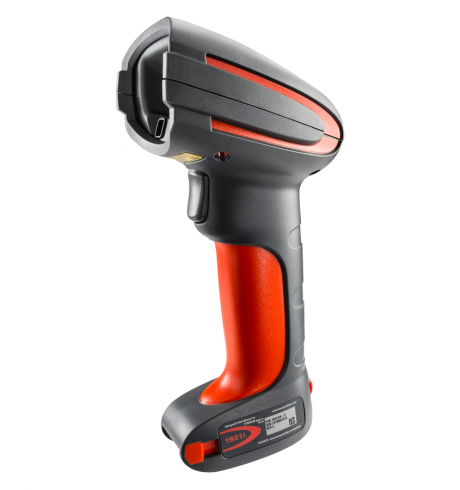 The Honeywell 1981i hand scanner is an all-rounder for industrial and production sectors. Well prepared for the cold, you may work with the Honeywell 1981i in temperatures down to -20°C. Thus, the scanner is predestined for industrial and cold storage environments. It has also proven its robustness under the harshest conditions through extensive testing. Falls from up to 2 m in height, even in cold temperatures, do not affect the scanner’s performance. The scanner features protection class rating IP65 and IP51 for the base, protecting it even better against the ingress of foreign particles and splash water. With the area imager users scan 1D and 2D barcodes from a distance of 15 cm up to 16 m. Thanks to Bluetooth 2.1 the 1981i has a wireless range of up to 100 m to the base. Integrating the scanner is possible via USB, keyboard wedge and RS232. Industrial-suited cables allow for data transmission from the base even under the most adverse environmental conditions.